RAGDOLL COTTAGE is a fully self contained , self catering, two bedroomed cottage, with a full kitchen, and a large conservatory. A comfortable and modern cottage. 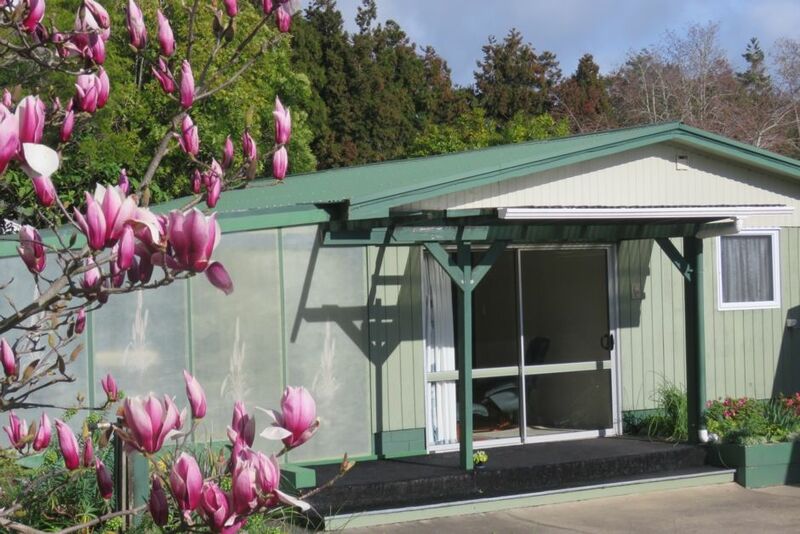 Set in beautiful sub tropical gardens, on a 10 acre lifestyle block, just north of Kerikeri. A great base to explore the delightful tourist destinations of the top part of New Zealand. Huge spa pool, can fit a family. Plenty of off road parking for cars and boats. Cot and highchair can be provided. Enclosed patio / conservatory with a gas BBQ, dining table and chairs. The main bedroom opens onto its own deck. Childrens trampoline, and a "wee-ones" swing set and a netball hoop. You can hand feed the friendly sheep, cows and donkeys . Feed the chickens. The main bedroom has a queen sized bed, and the second bedroom has twin singles, that can become a king bed. A rollaway or cot can also fit into the 2nd bedroom. There is a comfortable queen sized sofa bed in the lounge. Northland's best beaches Matauri Bay and Te Ngaere Bay are less than 20 minutes away. A Minium rate applies for summer and other peak holiday periods for up to 2 people. The cottage can sleep up to 6 people. We also have available Black Cat Cottage that sleeps 6. Two people=$110 to $135. extra adults $25 each. Children $15 each per night. Huge hot spa pool. A family favourite. This is a very special place to stay with its picturesque gardens and fields, complete with friendly farm animals who love being fed. The cottage was roomy and very well equipped with comfortable new beds and bedding. We all loved the outdoor spa for star gazing at nighttime. A fab base for families or smaller groups to explore the far north or Bay of Islands. We were sad to only stay such a short time and will definitely settle in for longer next time. Perfect little place to stay in the Kerikeri area. Perfect little place to stay in the Kerikeri area. The cottage was clean and nicely furnished, added bonus was having the linen and port-o-cot provided. Wouldn't hesitate to recommend this accommodation to other families. Lovely cottage with everything you need, and more. Highlights - were eating the fruit from the orchard and stargazing in the hot tub. Clean and tidy. Choice of cooking with oven, microwave and BBQ. Easy access - just north of Kerikeri, away from the centre, but everything within easy reach. Loved the property, easy access, easy car/trailer parking, very clean and friendly service. Loved the property, easy access, easy car/trailer parking, very clean and friendly service. Great for the kids with all the farm animals. Stay was comfortable and spacious. Stay was comfortable and spacious. No issues whatsoever! Heartily recommend.